This is a preschool lesson to be taught in the weeks leading up to Thanksgiving. It would be perfect for your Preschool Sunday School lesson or other ministry setting. Parents could also use this lesson plan at home. The children will learn about the symbol and meaning of the cornucopia. They will reflect upon what God has blessed them with in abundance. This lesson should be followed up the next week with a lesson about how we should give thanks in all circumstances as the Christian life will not always seem blessed with abundance. As this lesson is written for preschoolers, it has been kept simple focusing on one aspect of the Christian life. Learning Objective: The children will think about what God has blessed them with abundantly. 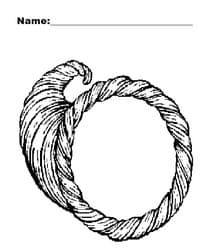 Materials Needed: A picture of or a decorative cornucopia, Cornucopia worksheet, crayons, pencils. “It is called a cornucopia. Now repeat that word after me, corn-u-cop-ia.” If possible, write the word cornucopia on a whiteboard for them to see. Read aloud the Bible verse. “What are some good things God has given you in your life?” Take some suggestions from the children. Pass out the cornucopia worksheet and crayons. The children will then draw things they are thankful for in their life. More Thanksgiving Materials: You can download our Thanksgiving Coloring Pages or check out another Preschool Bible lesson for Thanksgiving. Tony Kummer (Editor) reviewed & updated this page on : November 14, 2010 at 5:30 pm. All our content is peer reviewed by our readers, simply leave a comment on any post suggest an update.